As you visit the classroom you will come to better understand the philosophy behind the environment and the materials. You will observe activities or “works” attractively displayed on shelves at the child’s level. A classroom that is carefully prepared and can be modified to meet the children’s needs sets the stage for autonomous learning. With current concerns of “pressuring” young children, hopefully you’ll see the difference between providing the child with intellectual stimulation, and “force feeding”. 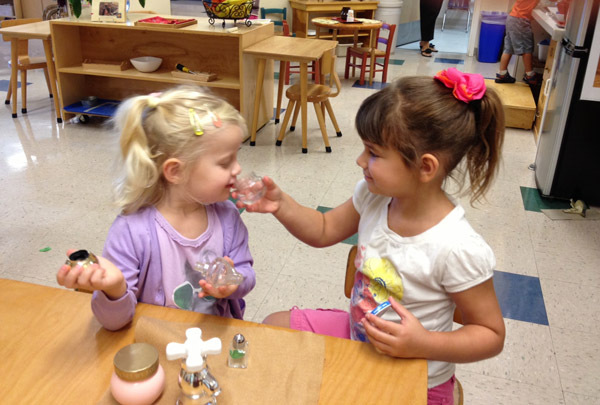 When you choose Maple Montessori, you choose more then “just a preschool” or “just something for a few hours a day”. Consider that the preschool teacher is often one of the first adults outside of the family that the child forms a relationship with and learns to trust. Preschool teachers influence how the child interacts with future teachers and other adults throughout their life. The preschool teacher plays a significant role in the child’s developing view of him or herself as a learner and member of the classroom community. Hopefully you will come to know that I have a passion for early childhood and the Montessori method. The rewards of my career have been countless. I know of no other career outside my role as a mother, where I would be surrounded each day by so many sweet smiles that look up to me as the smartest, most knowledgeable, and brilliant person they’ve ever known, aside from their own parents. I take this responsibility and your trust in me seriously. As parents you are your child’s first teacher, and home is the first classroom. I appreciate you allowing me to become your child’s second teacher, and letting Maple Montessori serve as your child’s second classroom. We invite parents to schedule a time to come and experience why Maple Mountain Montessori provides world class hands on Montessori schooling. Simply click on the link to schedule a time to visit a Maple Mountain Montessori class before enrolling your student. Maple Mountain Montessori is dedicated to the enrichment and education of the young child, while viewing each as a unique individual. We seek to inspire a lifelong and joyful pursuit of learning.